Larry retired from his posinon as Manager of Erickson Co-op in May 1996, and is enjoying his retire­ ment being involved in community work. Linda plans to retire from her position as Secretary/Librarian, at Sandy Lake School, in June 2000. They plan to travel and spend more time with their families. Sherry ( daughter) and husband, Dennis Green, live in Winnipeg, MB. They have three children: Benjamin (born 1984), Elijah (born 1987) and Jessi (born 1989). 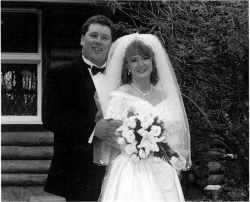 Tracy (daughter) was divorced in 1990 and re-married to Huntly Ketchen in December 1996. Tracy, Huntly, and her sons, Jeremy (born 1983) and Matthew (born 1985), live in Victoria, Be. Donald George Steele was born to Matthew and Edna Steele. He moved with his parents to Erickson, MB III 1952 from Cardale, MB. Don graduated from the Erickson High School III 1958 and then attended Brandon College. He worked the summer months on the oilrigs in Saskatchewan. Don worked for Beaver Lumber in Erickson, Dauphin and Thompson. In January 1961, he commenced work for Gordon's Service, as Part's Manager, and also when the ownership changed to Parkwood Auto in 1968. Don married Shirley Purves at the Hilltop Baptist Church on October 24, 1964. Shirley started work in June 1968 as a part-time assistant at the Erickson Post Office and, in September 1985, was appointed Postmistress. Clarice Rae graduated from the Erickson Collegiate III 1983. She graduated from Brandon School of Nursing in 1986 as a Registered Nurse. She nursed at the Thompson General Hospital, 1986-1989, and the Royal Alexander Hospital in Edmonton, AB, 1989-1990. In 1990 Clarice returned to Brandon, MB and nurses in Labor and Delivery at the Brandon General Hospital. She married Rodney Robinson on September 26, 1998 and they reside in Minnedosa, MB. Rodney works for Ken Beatty's Construction. They are expecting their first child in August 2000. 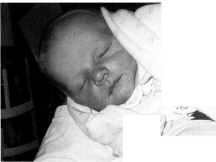 Editor S Note: Colin Matthew was born July 18, 2000. Glen Donald graduated from the Erickson Collegiate in 1988 and attended Brandon University. Glen moved to Edmonton, AB in 1990 and returned to Erickson to work at the Erickson Co-op Store. He was transferred to the Dauphin Co-op in 1994. In April 1996 he assumed the position of Food Manager at the Arborg Co-op. 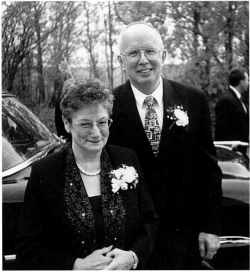 Glen married Corrine Skwarok of Dauphin, MB III October 1999. They have a son, Darien Bramwell.